Religious freedom, an American ideal, has on occasion been denied certain sects because of prejudice. Mormons were once persecuted and forced from their homes. The north bank of the Platte River served as the exodus route for thousands of members of the Church of Jesus Christ of Latter-day Saints (Mormons). Driven from Nauvoo, Illinois, Mormon leader Brigham Young led the first migration up this valley in 1847 to found the proposed state of Deseret, now Utah. During the following two decades, thousands more gathered at Winter Quarters on the west bank of the Missouri River near present Florence, Nebraska, before beginning the trek across the plains and mountains to their land of Milk and Honey. The journey called for strength and courage, as well as faith, for tragedy often stalked their wagons and handcarts, turning this valley into a Mormon "trail of tears." Hundreds of pioneers lie buried along this trail, most in unmarked graves. After 1860 the overland trail along the south bank of the river was lined with road ranches and stage stations, but the Mormon Trail had few such conveniences, and the pioneer settlements here in Hall County were almost the last vestiges of civilization until the travelers reached Utah. 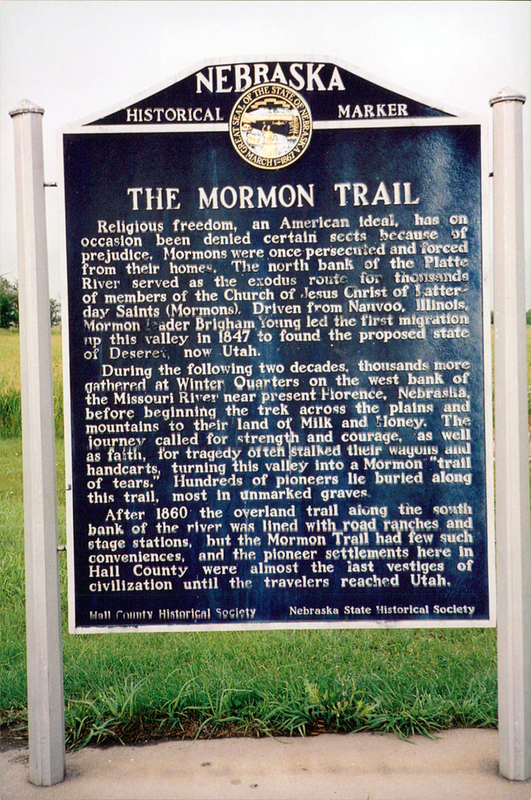 “The Mormon Trail,” Explore Nebraska History, accessed April 19, 2019, https://mynehistory.com/items/show/249.